Our new guitar rack ROCKS!!! It’s finally here! 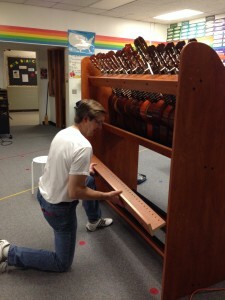 The guitar rack we ordered about six weeks ago has made its way across the country to our school. 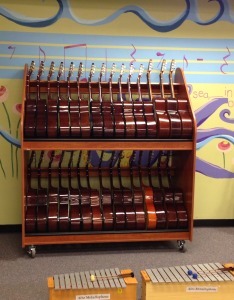 We owe a BIG thank you to Cindy Stiteler and the Siegel Foundation for granting us the funds to purchase the guitar rack, and special thanks to the Fir Grove PTO (especially Sarah Scott and Rhonda McCall) for carefully servicing the funds to ensure a smooth transaction. What an improvement! Everything is so neat and organized now. 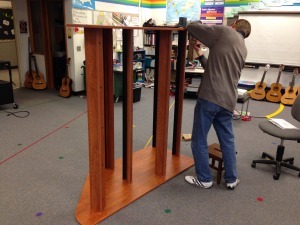 The neat-freak in Mrs. Colett is jumping for joy. This is what it looked like before: TOO MESSY! And there was nowhere for anyone to sit at the back of the room while waiting for their turn on the xylophones. 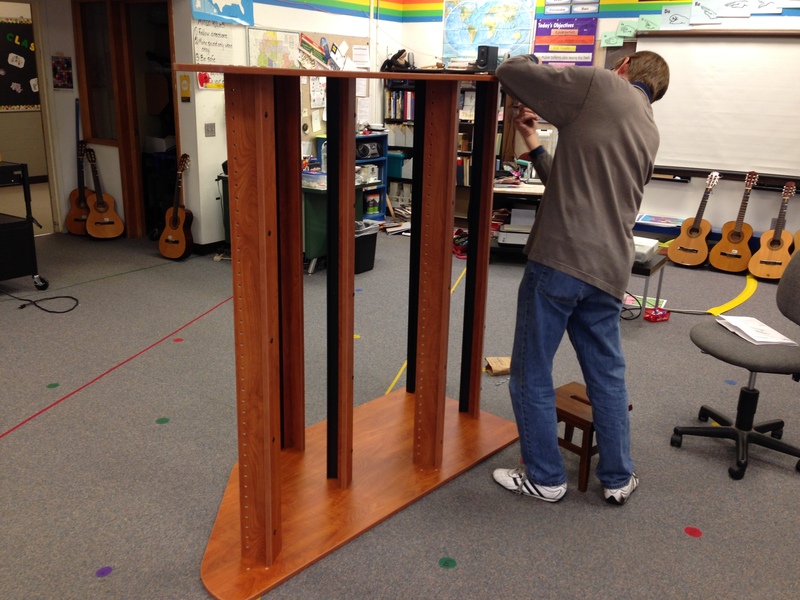 Mrs. Colett’s father, Steve Mohr, is our guitar hero for helping us assemble the rack. All the students noticed how handsome it looked on display at the back of the classroom this week. So exciting!!! Thanks again, Dad! 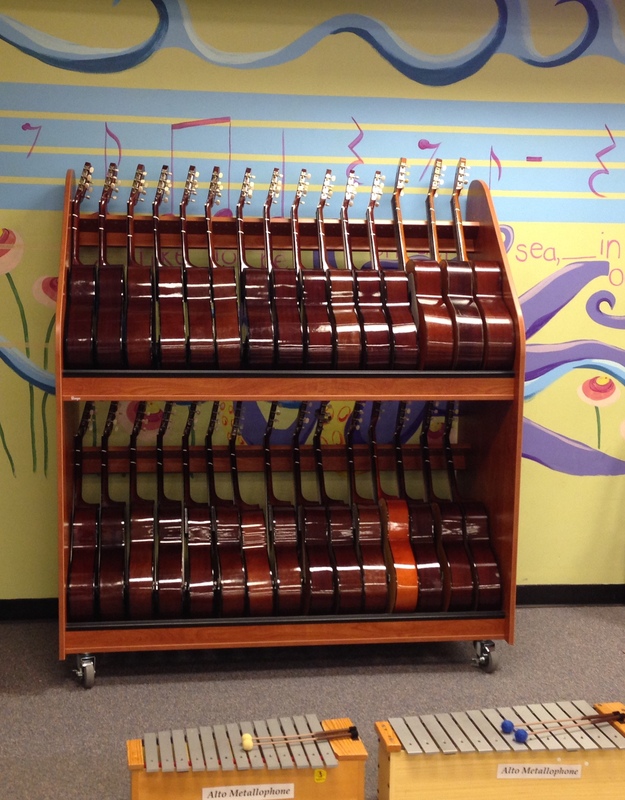 The cart is a beautiful way to store, transport, and display our valuable classroom set of acoustic guitars and the 4th graders will be using it at their Dec 11th concert! Come on over to the Fir Grove gym at 6:30 PM that night to Oooh! and Ahhh! at our fabulous student performances and take a gander at the new guitar rack in person! 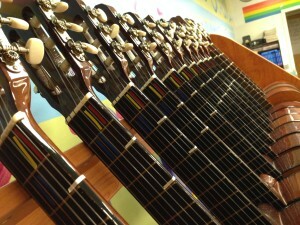 Our collection of guitars includes 13 fairly new instruments on permanent loan to us from Mountain View middle school. A warm thank you to new MVMS Choir Director, Jessica McKeirnan, and Principal, Claudia Ruff, for helping arrange the loan last month. It’s so nice to have a complete set of matching guitars to make learning more straightforward and harmonious. Our awesome guitars are ready for Fir Grove 4th and 5th graders to JAM OUT!! !